Padded Bellow Tongue. 4 Metal D-Ring For Speed Lacing. Quick Sweat Absorbing Mesh Lining..
Padded Collar and Padded Bellow Tongue. 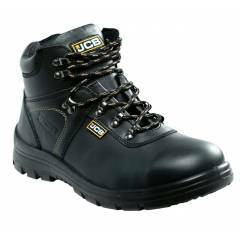 Oil & Chemical Resistant Antistatic Sole. Anti-Slip Sole SRC. Direct Injected Double Density PU Sole. It does not slip and gives a good grip even at rough surfaces. Thanks Moglix for giving option to buy this product, give telephonic support for buying and fast hassle free delivery.